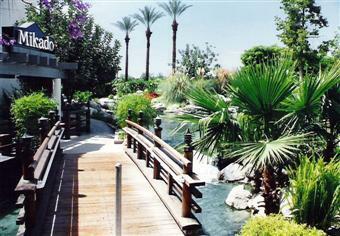 We surprised ourselves in 1994 by buying a timeshare week at the Marriott Desert Springs resort. We had been through a few timeshare sales pitches, just to take advantage of the free vacations offered, but we were never tempted to purchase. Timesharing always seemed too restrictive. But Marriott was the first big hotel chain to enter the timeshare business, which eliminated the previous uncertainties about management and maintenance. Marriott also introduced a lot of flexibility into timesharing, which made it truly attractive. The two-bedroom units can be used in a conventional manner by staying one week in the whole villa. Or they can be divided into a master suite (with living room and full kitchen) and a studio unit (with kitchenette), and we can stay one week in each portion. The vacation time is no longer a fixed week every year, but rather a floating week throughout the year. We can use the whole week at once, or split it into two shorter vacations. We can stay at our own resort, or exchange it for other resorts around the world via Interval International. And lastly, we can exchange our week for Marriott Rewards points, which can be used for hotel stays, airline tickets, etc. 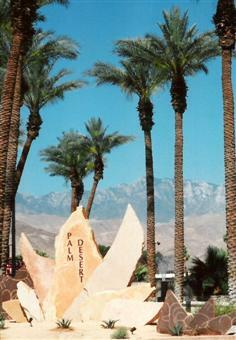 The resort is located adjacent to the Marriott Desert Springs Resort & Spa in Palm Desert, CA (which borders Palm Springs, about two hours east of Los Angeles). 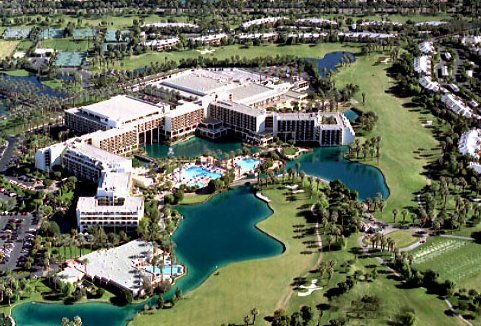 This aerial view shows the hotel, surrounded by lakes, with some of the timeshare villas visible in the upper right. Shuttle vans run between the hotel and the timeshare villas, and timeshare vistors have full use of all hotel amenities, including free admission to the Spa. 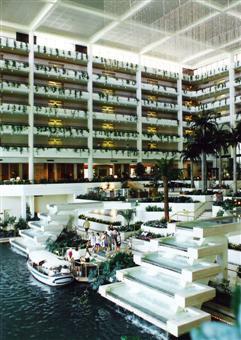 The hotel lobby is spectacular, with twinkling lights hanging from the ceiling, vines dangling over the balconies, and waterfalls cascading into an indoor lake. 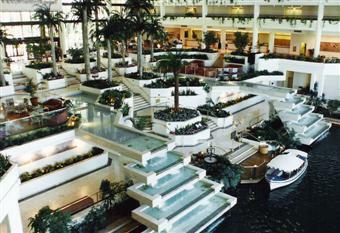 Water taxis actually come inside the lobby to provide transportation around the resort grounds. 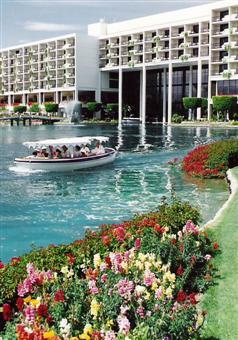 The water taxis exit the lobby through big glass doors, and whisk you off to the various restaurants located on the many interconnected lakes. 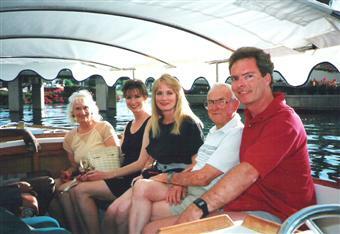 Here we are riding one of the boats to dinner, along with Ann's parents Eva & Harry and her sister Mary Ellen. It felt like we were on Disneyland's Jungle Cruise ride! This is the dock where the boat drops you off at the Mikado Japanese Restaurant. 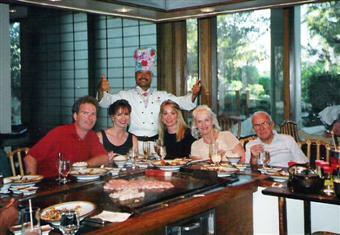 The Mikado is one of those "food-prepared-at-your-table" restaurants that are a lot of fun when you have a group of people.